Experts and workshops have suggested that the best time to run ad campaigns is approximately 5Pm-midnight EST. Some have even advised pausing campaigns after the midnight hour. However, first-hand data shows that this might not be the best strategy. Clickable and Sankia collected six months of conversion data from the search ads of a group of leading e-commerce retailers. We analyzed the results to determine the optimal day parting and hourly schedules of their ad campaigns. In Figure 1, the X-axis plots the time of day (in U.S. Eastern timezone) and the Y-axis plots the aggregated revenue in U.S. dollars. 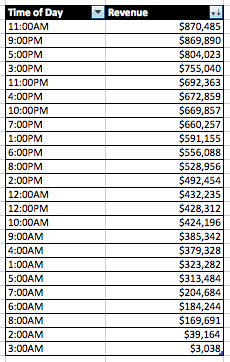 Table 1 shows the hours and the sales for the hour in descending order. The most revealing highlight of the data in Figure 1 is that although the aggregated revenue generated was high during the 12-hour time period (11:00AM-11:00PM), there was significant and non-trivial revenue during the conventional lean time periods of 12:00AM – 10:00AM. We offer the more granular data in Figure 2. For example, at 4:00 AM, there is one transaction for more than $60,000. As you can see, had the campaigns been paused during this period, the e-commerce brand would have lost significant sales. However, as always, the only real answer is to use first-hand data. You can “scoop up” inexpensive clicks during the times where most everyone is not running their campaigns and you can get outlier results like the one noted above. We at Clickable and Sankia will continue to share the results of our studies in this blog. What do you think of this post? What would you like us to discuss and share?